Eight years to the day they celebrated promotion into English Rugby’s Premiership, there was to be no repeat of the final heroics as Exeter Chiefs slipped to defeat at the hands of Saracens. Hopes of back-to-back titles for Rob Baxter’s side were extinguished by the impressive Londoners, who proved simply too hot to handle in the searing heat.Winger Chris Wyles helped himself to two of their four tries on the day, while Billy Vunipola and Nathan Earle also got in on the try-scoring act. 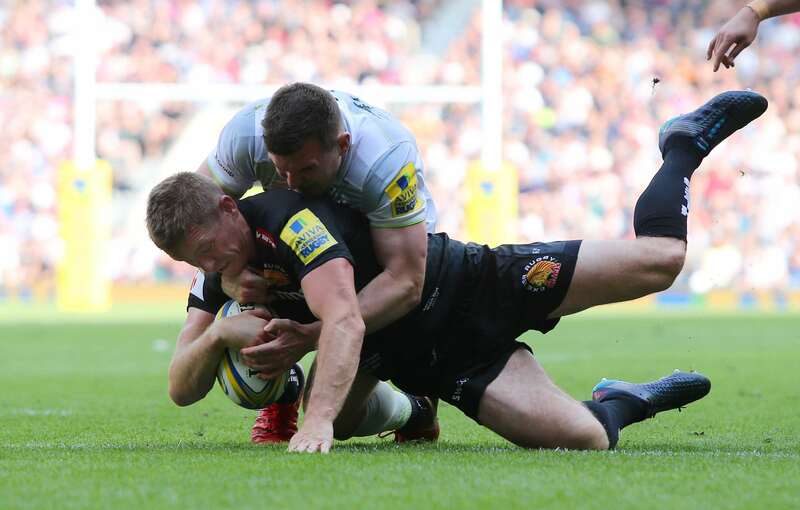 Kicks from Owen Farrell and Ben Spencer completed the job for Mark McCall’s men, who despite finishing eight points adrift of the Chiefs after the regular league season, had too much for the Chiefs on the day. Fly-half Joe Simmonds fired the Chiefs into an early lead and Gareth Steenson converted his own second half score, but they were brief highlights as the Devonians saw their grip on English rugby’s top prize slip away from them. With both sides able to parade the same personnel from the semi-finals the week previous, it was the Chiefs who started the brighter on a sun-drenched afternoon in the capital.Up against a stiff downfield wind, Baxter’s side set the early tone, throwing themselves into a barrage of hard-hitting collisions. That early pressure saw them position themselves deep within the Sarries half, from which the Chiefs milked the game’s opening points, Sarries and England prop Mako Vunipola the man singled out for playing the ball on the floor.Up stepped the younger of the two Simmonds brothers to slot a routine penalty and give the Devonians the early ascendancy. Three minutes later and the Chiefs were afforded a second shot at the target, Vincent Koch adjudged to have come in front the wrong side by referee Wayne Barnes, who was officiating his 200th Premiership game.Sadly, Simmonds could not make the most of the opportunity on this occasion, screwing his lengthy kick from the left touchline wide of the mark. Saracens duly made the most of the let-off and on the 15 minute mark they bagged the game’s opening try.Using their heavyweight pack to punch holes into the Exeter rearguard, they created the platform from which Billy Vunipola was able to bulldoze his way over by the left post.Farrell converted to make it a maximum haul for Mark McCall’s side. Worse was to follow for the defending champions who, just four minutes later, leaked a second score.Clever approach play from Sarries saw them create an overlap wide on the left, the fruits of which allowed full-back Alex Goode to feed back three colleague Wyles, on his final appearance, to score in the left corner. Farrell shanked the testing touchline conversion and would miss an equally tough penalty chance on the stroke of half time to leave just nine points between the two at the turn. In between those two kicks, the Chiefs did their utmost to try and haul themselves back into the contest, but the strong press game of their rivals was hampering their charge and they were left to feed off scraps of possession. The Chiefs re-emerged for the second half clearly invigorated by a half time stimulus from Baxter and his fellow coaches. They bossed the opening few minutes in terms of possession, going left, then right, then back again, but Saracens were proving miserly in defence, thwarting their advances at every opportunity. Again, they soaked up everything the Chiefs could throw at them before hitting them with a huge hammer blow eight minutes into the half. The forwards again did the hard yards, bashing it up through the middle, before the ball was worked out wide to the left where Wyles was left open to dot down in the corner. Baxter had seen enough and wasted little time in changing the on-field personnel.A new-look front-row was added in the shape of Ben Moon, Jack Yeandle and Greg Holmes, while behind Gareth Steenson - the hero of 12 months ago - and fellow countryman Ian Whitten were also added to the fray. Sadly, the Chiefs were struggling to find their normally lethal attacking rhythm. When they did have the ball, too often they were guilty of failing to protect it sufficiently, as twice they were brushed aside by some ferocious counter rucking from Sarries. As the game headed towards the final quarter, so the Chiefs needed to summon a response of sorts. Solid pressure from Baxter’s side saw them propel themselves into the Sarries half, where a high tackle on Henry Slade allowed them to win a penalty. That was duly punted to the left corner, the drive went on, but it was cynically downed by Schalk Brits on his final game in professional rugby. The popular South African was spared no mercy by Barnes, who sent him to the cooler for a ten-minute stint. From the resultant penalty the Chiefs went from five metres out once more. Again, the drive went on from the ‘Men in Black’, but on this occasion it was Exeter who were deemed to have brought it to the floor. It meant they were forced wide and although they hammered on the door with a series of close-range raids, the last of which was from the hulking frame of Dave Ewers, it was adjudged to have been held up. No matter, the Chiefs duly made their numerical advantage tell as from the resultant five metre scrum, they went wide to their backline, the fruits of which resulted in a try for Steenson, which he also converted. In an instance, the travelling Tribe had awoken from their slumber. The ‘Tomahawk Chop’ echoed around the national stadium as the restart saw Steenson attack once more down the right flank. However, just as the Chiefs looked to get on the front foot once more, the mass frame of Maro Itoje saw him lock in on Holmes to win a crucial turnover. Able to clear their lines down field, Sarries rumbled themselves back into a key position. Using the same pick-and-go tactic that had served the Chiefs so well for much of the campaign, they did enough in attack to net themselves a penalty that replacement Spencer slotted from in front of the Exeter posts. As the minutes ticked by, so Sarries adopted a simple, yet highly effective game of keep ball. They starved the Chiefs of possession, grinding down the dying embers of this brutal battle with ruthless efficiency. In the end, Baxter’s side could do no more. Sarries, on the other hand, were far from finished and with just a minute remaining they put the seal on a polished performance, working the opening for replacement Earle to dive over in the corner. For the Chiefs, a well-earned rest now awaits them over the next two months, after which it all begins again and we all know what happened the last time we lost to Saracens at HQ! Chiefs: L Turner; J Nowell, H Slade, S Hill (I Whitten 49), O Woodburn; J Simmonds (G Steenson (49), N White (S Townsend 59); A Hepburn (B Moon 49), L Cowan-Dickie (J Yeandle 49), T Francis (G Holmes 49); M Lees (S Skinner 51), J Hill; D Ewers, D Armand (capt, T Waldrom 31-40), S Simmonds (T Waldrom 66). Saracens: A Goode; S Maitland, A Lozowski, B Barritt (capt, M Bosch 51-59), C Wyles (J George 62-72, N Earle 75); O Farrell (M Bosch 66), R Wigglesworth (B Spencer 59); M Vunipola (R Barrington 75), J George (S Brits 53), V Koch (J Figallo 53); M Itoje, G Kruis; N Isiekwe (W Skelton 66), J Wray, B Vunipola (M Rhodes 59).